An exotice Arabic dish we cooked earlier this month, takes about an hour to make, and is recommended for larger gatherings. Mix well all the ingredients of the Kofta. Create finger shaped (or balls) of the mix. Put a little bit of oil on a non-stick frying pan and start frying the kofta until it is well done. (It is also possible to grill the kofta instead of frying it if you would rather do that instead). For the zucchini sauce, add some olive oil to a saucepot and sautÃ© the garlic and the red chili for 3 minutes. Add the balsamic vinegar and after a minute add all the chopped tomatoes with the bay leaves. Wait until the sauce starts to boil then cover the saucepot and put it on the lowest flame for 10 minutes. Cut the zucchini to small pieces and sautÃ© it in the same pan you used for frying the kofta . Keep sautÃ©ing the zucchini for 5 minutes. Add the zucchini, parsely and mint to the tomatoe sauce in the saucepot. Add some salt and peper as desired to the sauce. Cover the sauce pot and leave it on a low flame until the zucchini is well cooked. Place the kofta on the serving plate and pour the sauce on top of it. The uncreatively named Turkish House Restaurant is located in the commercial area of Al Khuwair next to Al Liwan shisha joint, it is the most popular Turkish restaurant in town. Turkish House is a proper dine-in restaurant and is not another one of those little generic Turkish coffeeshops/sandwich-shops scattered all over Muscat. Many call it ‘The Fish Place’ for its excellent fish dishes. Turkish House is adored by many, it is normal for people to stand in queue waiting for tables to be available during lunch time. The restaurant has started as a small regular sized restaurant, it expanded in the past when they added the new ‘romantic’ section (as some lame Omanis like to call it) in the back of their main building, and it is currently in the process of taking over the entire floor of its original building. That new section was not yet opened when we visited the restaurant two weeks ago. The crowd of Turkish House is very diverse, during our stay we say a gathering of some college boys and girls, a table occupied by a family, and a business looking group on the other side. The place seems to attract both Omanis and expats as much. The menu of Turkish House shies from being exotically Turkish and mainly consists of generic grilled Mediterranean dishes, which is not necessarily a bad thing at all. Cold Mediterranean starters, salads, grilled dishes, fish dishes, and fresh juices are the main highlights of the menu and they are all usually served with a large naan bread and/or chips. In my most recent visit to Turkish House I had a humous starter and a dish of chicken kebabs served with chips (not pictured), which was very well cooked, tender, and tasted simply delicious. The service of Turkish House is average I guess, their staff are relatively friendly and seem to know regular customers, but the field at which Turkish House really shines is the food, which is really good. 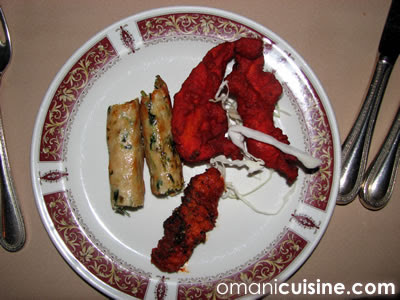 Prices of Turkish House are moderate, a mixed starter dish (pictured above), a mixed grills dish for two (pictured above), and two fresh juices cost around RO 10. 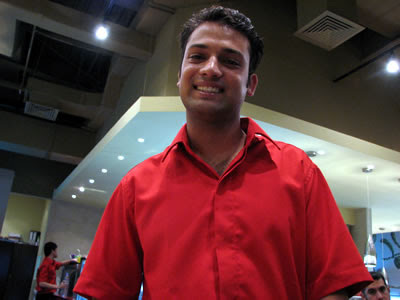 Regular dishes cost around RO 3 and Fish dishes start from RO 6. Lovers of Mediterranean food, grilled food, and fish should check out Turkish House. We apologise for not making any posts for the whole of October. 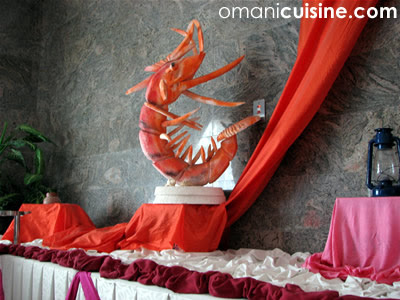 The Omani Cuisine never really stopped during that period, but for various random reasons we never managed to sit down and write what we have been up to. We promise that we will make up for this with regular recipes and reviews from now on. 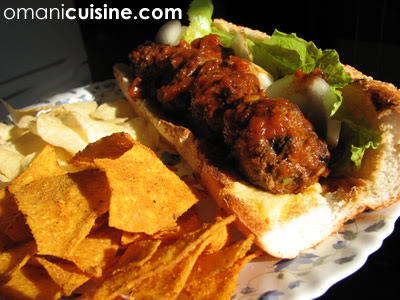 Our latest kitchen adventure is, as we like to call it, a meat ball sub, very fun to make and to eat. Mix the minced meat with the shallots, mint and coriander in a bowl. Add the Dijon mustard, garlic and cheese to the bowl mix. Add 1 tsp of cinnamon, crushed chili, salt, pepper and flour and mix these with all the ingredients well together. Divide the mix into medium sized balls and put them in a fridge for half hour. In the mean time, boil some water (about 1 L) in a pot. Add the remaining cinnamon to the water when it starts boiling. Wait 5 minutes and then add the tomato paste, and the zest and juice of the lemon. Stir the water mix and leave to boil for another 10 minutes. Filter the water to get rid of the hard ingredients and leave the water to be used later. Using another pot, fry the onion in some oil until the onion turns to golden. Add the tomatoes and stir. When the tomato starts drying up add some of the water mix we made in the earlier step(don’t put much water, as it only to make sure the tomato and onion don’t burn). Stir and repeat for a period of 20 minutes. Heat a frying pan and put some butter on it. Get the balls out of the fridge and fry them on the pan while turning the balls around to fry all the surface of the balls. Once the whole surface of all the balls is fried add the vinegar and continue turning the balls around. Start adding some of the tomato/onion mix and the liquid to the meat balls. 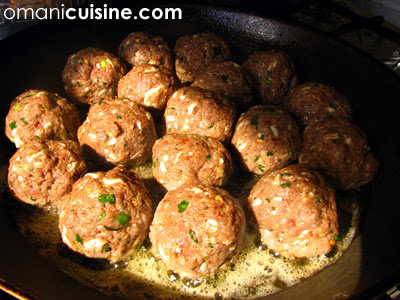 Keep this process for 15 minutes to fully cook the meat balls. Santino’s was recently rebranded as Pane Caldo. 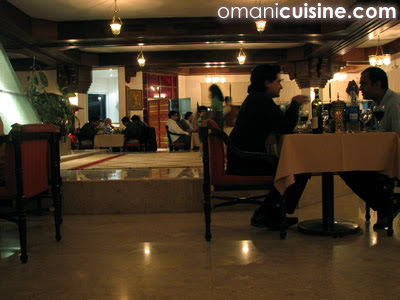 The restaurant is still in the same place in Jawharat Al Shatti, but now bigger (they invaded the shop block next to them), they did not change the furniture of the place and there is apparent change in the staff or the ambience of the place either. However, Pane Caldo does seem to have now a more emphasised contemporary image that is less casual and more fancy with their choice of colours and finish-off I guess. I am not sure if it was just me, or the fact that it was my first time to set at that particular place in the restaurant, but there did not seem to be a lot of private space left between the dinning tables on the center and the left side of the restaurant. It’s true that the place is bigger now, but it still feels very tight because of the number of tables they have inside. Pane Caldo is not fully open yet, when I was there last week they had a temporary menu that was really difficult to read, we did not know where one item description ended and that of the next started. We did not know which of the numbers were the prices of what meals. 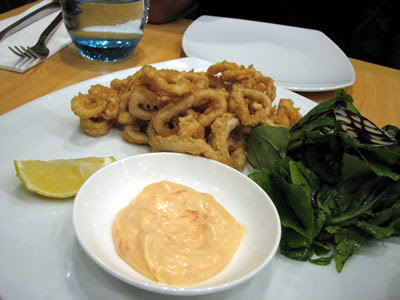 I am not sure of the number of new items were there on the menu, we had for the starter some mushrooms covered in cheese, which I did not like very much (I am no Super Mario), one of us had one of the calamari starters (photographed below). For the main course we had some sort of ‘red’ pizza that had beef, pepperoni, chicken strips, and tomato slices on it, which I thought was good, but not mind blowing. The place is still in the process of changing into its new brand, so it is not surprising that their menu is still not fully developed. I do not think that there was an increase in the prices, but I am not really sure of that as I did not actually compare numbers. 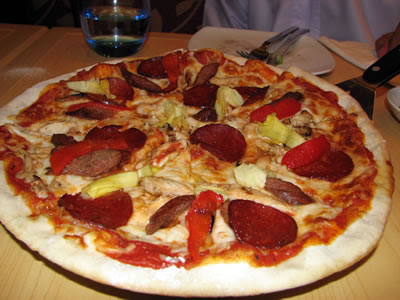 Check our previous review of Santino’s here. 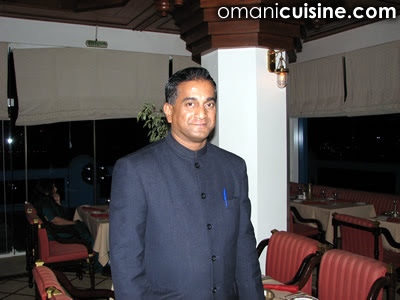 Mumtaz Mahal is most probably the finest Indian restaurant in town, it is located on the hill behind the Qurum Natural Park and has been in service since the 80s. 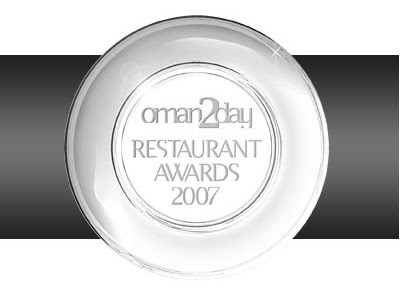 It is loved madly by the Oman Today magazine as they gave it the award for the best Indian restaurant four times in the five years they’ve been doing their awards. 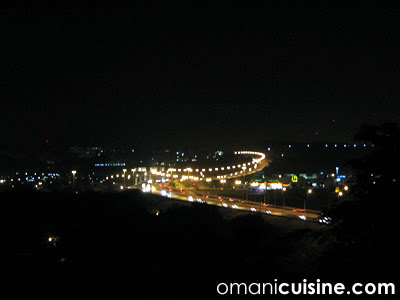 A review about Mumtaz Mahal is not complete without talking about the location of the restaurant and the view, especially at night when all the blinders that cover the glass walls are lifted to show the view of the road lights and the movement of the cars from above to make a charming sight of the busy life of modern Muscat. Mumtaz is very spacious with loads and loads of seats, there are also a couple of tables outside the main hall that people sit at when the weather is good. A live band is supposed to perform in the main hall of the restaurant on some days, but I’ve been to the restaurant twice, once on a weekend and another on a week day, and I did not see this band. The place can easily be fully occupied on any day of the week, when we got there at 7 .30pm yesterday there was barely anybody at the restaurant, but by the time we left around 9.30pm the place was full. 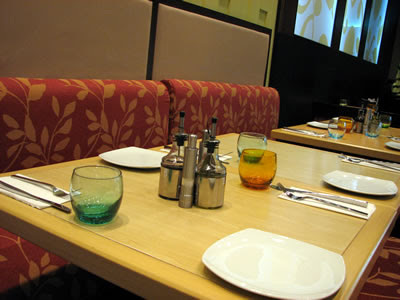 It is recommended to book a table in advance instead of showing up expecting to be seated right away. The crowd at Mumtaz seemed to be older than those at the places we previously reviewed with a lot of expatriate families dinning in. The staff of Mumtaz were very friendly and talkative, at the two times I’ve been to it they helped us with the menu, chatted about India (as if we’ve never had Indian food before?) and even talked about random stuff like cameras and photography. They food did not take a lot of time to get to our table, they literally put the food on our plates and helped us share the starters, we were very impressed. 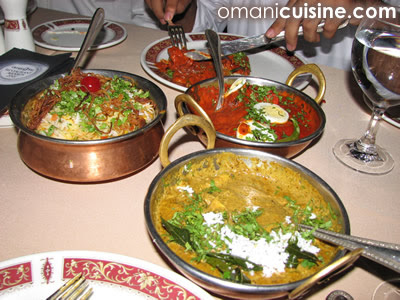 The menu of Mumtaz is pretty extensive, in addition to their starters they also serve soups, dry tandoor grilled dishes and curry. 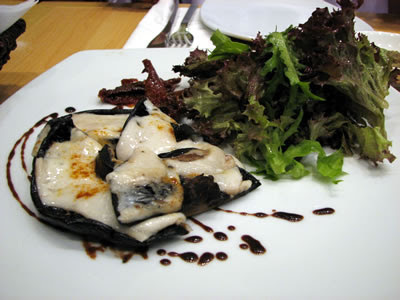 There are vegetarian stuff in all sections of the menu and a lot of fish and lobster main courses as well. Spicy dishes are labeled with a small drawing of a chili to warn those who cannot handle spicy food. For the starters we had the three non-vegeterian items they had on their menu, namely Machli Masaledar, these are deep friend fish fingers cooked with spices (the one at the bottom of the place in the image above), Chennai Murg, these are spicy deep friend chicken fillets (on the right side of the plate in the image above) and Murg Methi Kebab, some tandoor flavoured chicken kebabs cooked with some sort of leaves. I liked the chicken fingers more than anything else, the way they were cooked and the way they tasted made it irresistible. The fish fingers came second and the kebabs came third. They all had a hint of spiciness which I did not think was overly hot. For the main course we had three different chicken dishes, Murg Angaarey – extra spicy tender chicken pieces cooked with garlic, Balti Murg – chicken cooked in traditional North Indian sauce, Chennai Murg Masala – a spicy dish of dry chicken cubes with coconut, curry leaves and black pepper. 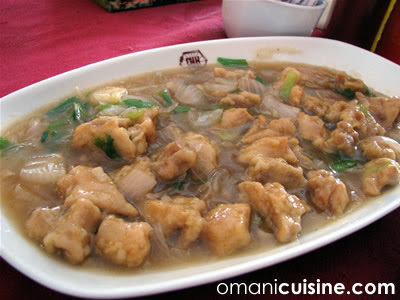 We also had a bowl of Ghosht Shahi Khorma -a meat dish cooked in gravy sauce with dry fruits and nuts. We ate those with chicken biryani rice and some garlic nan bread. The food we had was very good, a couple of dishes we had were extra spicy and I would not recommend them for the weak-hearted. For a first timer I would recommend Balti Murg with plain rice or chicken biryani rice – you can’t go wrong with the basics! We checked their dessert menu, they had many variations of Indian sweets with cheese, which we did not try and had instead their ‘home-made’ ice creams, it tasted very *unique* and had some saffron in it. Mumtaz is obviously more expensive than the majority of Indian restaurants in town, the starters cost about RO 1.5 to RO 2 each, while vegeterian, chicken, and meat main courses cost RO 2.5 to RO 4, and sea food dishes cost RO 5 to RO 8. Mumtaz is also a licensed restaurant, we were probably the only table that did not order any alcohol, you see bottles of wine coming and going all the time. A guy on a table next to us ordered some sort of pinched coffee which was made live right next to him. 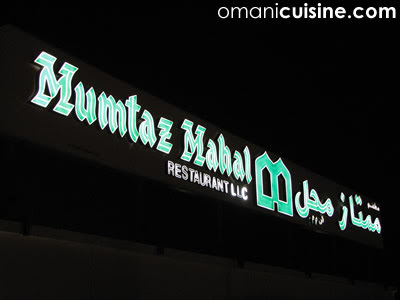 We thought that the experience at Mumtaz was amazing, we had a great time, the food was delicious and the service was very good. I’m currently in Salalah attending a legal workshop for one week. 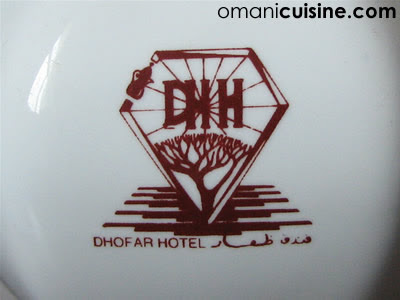 I’m staying at Dhofar Hotel, a 3-star hotel near the city center. I hate my employer for giving me such a small allowance for this trip. I wish I could sue them. I know I can’t. Dhofar Hotel is surprisingly so much better than what I expected, but this review is not about the hotel, it’s about their restaurant. The restaurant is on the ground floor of the hotel, it is relatively spacious, and it looks like the restaurant serves some sort of buffet at sometime, probably dinner or something, it was not open for lunch today. The menu that I was offered at the restaurant was a stapled paper photocopy of the *room service* menu, the menu had cold starters such as salads, Lebanese cold starters, avocado with shrimps, and two hot starters, namely fried vegetarian Lebanese kebbeh and samosas. There are also several types of soups which I did not try. 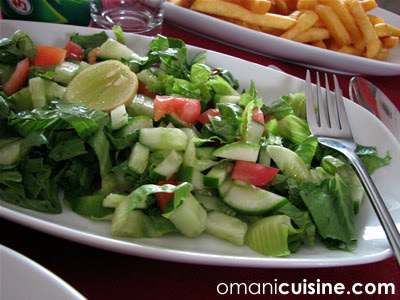 I had a season mixed salad for the starter, it was very simple (cucumber, lettece, and tomato) and felt very fresh. I had a chinese chili chicken dish with biryani rice. I also ordered a french fries sideline. I thought that the food was good, the rice, salad, and chips were all amazing, the chili chicken was just okay, it was well cooked, but not spicy enough (no schezwan sauce!) 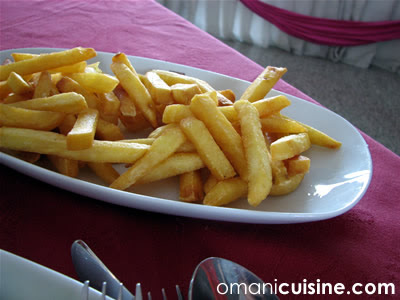 I really loved their french fries though, it was very thick and crunchy, something that you do not easily find in restaurants of this class. No fresh juices are served at this restaurants, I ended up drinking the usual Mountain Dew. 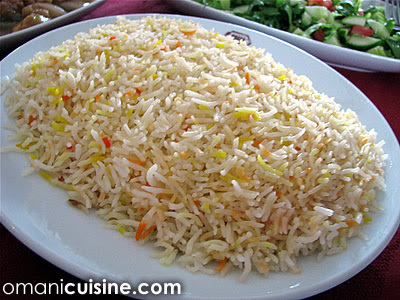 So in total I had one salad, a plate of french fries, chili chicken and biryani rice and all that came out for RO 3.600, for some reason, this included an arbitrary 17% tax. (Don’t know where it came from). 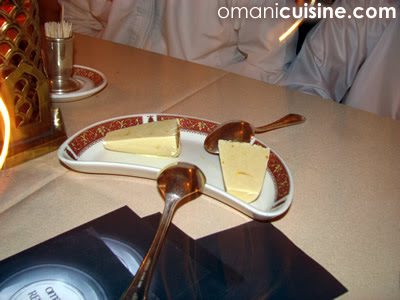 I thought that the service of the restaurant was quite slow even though I was the only customer in the restaurant (it looks like the khareer is already over), but I still think that overall I had a great experience at Dhofar Hotel’s restaurant, the place is very clean and the food was good. It is safe to try it out if you happen to come to this hotel.